This riveting quote set in motion a series of thoughtful answers to questions I posed to Irina Gorin, creator of Tales of a Musical Journey. A master teacher with decades of experience, she’s been riding a crest of success with two self-published volumes that have earned acclaim from piano instructors around the world. Satisfied parents, too, are chiming in with their testimonials, forming a choir of praise. All are inspired by two volumes that introduce beginners as young as 4-years old to the “Magical Kingdom of Sounds.” Immersed in a fairy-tale universe, they encounter characters such as King Meter, Fairy Musicalina, Princess Melody, and Prince Rhythm who lead the way with enchantment and imagination. A child’s progress will be nursed along in carefully conceived baby steps with a fundamental goal of teaching the singing tone and how to physically produce it. Learning in this environment with absorption of musical concepts comes quite naturally. I know, first-hand, because of my experience using Gorin’s Book I with Rina, who began piano lessons at age 4. To widen our understanding of Irina’s motivation to pave a new pedagogical path for beginning piano students, she agreed to answer the following questions. 1) Tell us about your own training in Russia and how it influenced your approach to teaching? I graduated from a music school, college and conservatory in the Ukraine. (It took more than 20 years of intensive training in total). Teaching was a favorite interest of mine from a very young age. And while performing never was my goal, I did well with those opportunities during my student years. In particular, I enjoyed accompanying and chamber music; playing duets and performing in ensembles. To this day I relish duet-playing with my students, and accompanying them when they study concertos. I took intensive teaching courses (a total of 8 semesters) in college and conservatory and started working as a teacher at the age of 17. My first teaching experience was at college, where I observed my instructor mentoring the same student every week. The second lesson of the week I would teach this student on my own while my instructor would evaluate progress and move on to the next step in the learning process. In this way, I worked with the same pupil in coordination with my instructor for a total of 2 years, following the child’s progress from a late beginner level to early advanced. In summary, living in the Ukraine afforded a vast opportunity to observe many master teachers in the lesson environment while it also exposed me to a variety of master classes, concerts, lectures, workshops, not to mention hundreds of books on piano pedagogy. Eventually, I worked for years in a children’s music school beside 60 piano teachers who were of different ages, backgrounds and experiences. In this stimulating environment, there were joint recitals, discussions, and classes that continued to feed my growing interest in teaching. 2) What prompted you to create your own creative learning materials, given the vast array of popular method books out on the market? As piano teachers, we always strive to help students make the most progress possible. We want them to read notes fluently, develop good technical skills, perform confidently and expressively, and above all, we want them to enjoy playing piano and classical music. These goals are realistic ones if we have the right tools to approach our students in the very early stages of piano study. One tool is a good method book that can size down the presentation of complicated musical ideas, and make them digestible, interesting, logically connected, as well as visually and musically attractive. At the same time, teacher satisfaction with the materials is a high priority. For more than 30 years of teaching, I had been in search of such an ideal set of method books. I should backtrack a bit by saying that in the Ukraine where I studied and taught, there were no method books at all. All the materials the teachers had were selected books with no pictures or words to the songs. When I moved to USA in 1993, I was thrilled to discover method books such as as Alfred, Thompson, Bastien, Faber and Faber. They had pictures; they had words to the songs, and moreover, CD’s with accompaniments. I was amazed by how easy it was to teach students starting with 5-finger positions. It seemed logical and convenient. But in a short time, I started seeing some big obstacles associated with these materials. 1. Students could not read or play music that was not in a 5-finger position. With such patterns the five fingers are strictly fixed to certain notes in each position. Very quickly the students realize that they only need to pay attention to the fingerings so there’s no point in “reading” the notes because the same fingers are always “glued” to the same keys. 2. Another method-book related weakness was in the realm of technique, despite the existence of an entire album devoted it. Students who were exposed only to this material, had not developed a good hand position. With fingers being constantly fixed in 5-finger positions for months and sometimes years at a time, young hands became immobile which led to a permanently strained, stiff and clumsy physical approach to playing–along with collapsing fingers and sterile tone. 3. While mentoring young children who had been submerged in these method books for too long, I had the challenge of teaching them to play expressively. Students exposed to the five-finger positions, could care less about artistry, expression, and tone production. In addition, the existing piano books did not explore feelings, or different approaches to tone production. I must admit that part of the problem was tied to the prevalence of digital pianos, where touch could not affect tone. Nevertheless, method books, likewise didn’t flesh out aspects of tone production. They emphasized loud and soft sounds (p and f) which hadn’t much to do with playing expressively. So I was concerned with what had happened to feelings of sadness or happiness–being cheerful or gloomy. These were emotions children felt and understood by the age of 4. 4. Another difficulty with the standard method materials, was my having to use 4 or 5 different books in one short 30-minute lesson. These included SEPARATE Theory, Technique, Performance, Rhythm, Popular collections, etc. As a result, as soon as students transitioned to the classical repertoire, they quit piano lessons, because the learning challenge became overwhelming! It was devastating! I couldn’t return to the Russian teaching approach with its dry, visually unattractive materials. And besides the Russian selected books moved along too briskly. But I also couldn’t continue using American method books, having experienced unsuccessful results. So that’s when I started thinking about creating my own method book using a combination of both Russian and American pedagogical approaches, bringing out the best in both. My goal was to combine learning good technical habits with entertaining and fun musical material, using pictures, stories, and lyrics to the songs that would help students absorb complicated musical concepts. But I knew what a huge undertaking lay before me, and to that point I never had the time for it. Two years ago, four siblings of my existing students asked to begin piano lessons and all of them were 4-years old. Because I had never taught such young children before (usually starting students at 6 or 7 years old) I couldn’t even imagine teaching them with the existing methods on the market. So it seemed to be my calling, to make my dream come true. I started writing several chapters for every lesson, and by the end of the school year I had written two books that make up Tales of a Musical Journey. I also created a supplemental kit for Book 1 and videotaped all my lessons with beginners. With the help of a media professional, I created a DVD with 3.5 hours of lesson excerpts that corresponded to each chapter of Book 1. 3) How are your materials uniquely different? As pianists and teachers, we know that the main principle of acquiring technical skills is having freedom and flexibility in all the parts of our upper body: arms, fingers, wrists, elbows and shoulders. Not a a single note can be played well on the piano if joints are stiff and muscles are tense. Following the Russian pedagogic approach, I start teaching kids to play only one key at a time using finger #3, because this finger is in the middle of the hand, (the longest and the strongest), and when kids master the balancing of their hand by playing with this finger, it becomes much easier to use other fingers without tensing up unnecessary muscles. Playing with only one finger also makes it easier to control and relax the shoulders, wrists, etc. which are extremely important in playing the piano. In this endeavor, I focus on nurturing musical expression and creating a singing tone from the very beginning. At the same time, a gradual process of learning notes ensures development of good sight-reading skills. Intrinsic to my teaching, is using ONE book for technique, theory, etc. which saves lesson time and coordinates the materials so they are logically connected and well balanced. 4) I notice that you start children as young as 4. What are the advantages and disadvantages of teaching very young children before they can read or write? I approach teaching 4-year old students in the same way as I do with the 6-7 or older beginners. Some kids develop earlier and are ready to start piano lessons at a young age (the same applies to reading or math readiness). And while some need to wait until they’re more mature, say by 6 or 8, for others, it might be never, for that matter. If young students are ready and progress well, and if families are seriously involved in lessons with follow-up home practice, then those kids will have the advantage of reaching certain milestones sooner then other kids their age. I personally love working with this young age group, but it can sometimes be very emotionally draining. In the end, however, the joys of teaching children outweigh any negatives, so that’s why I continue to seed beginners and develop them to their full potential. It’s a unique privilege I cannot refuse. I’ve been following Irina for sometime now and she never ceases to amaze me with her enthusiasm and patience for teaching young beginners in a very particular way. I was therefore fascinated to read this interview with her from Arioso7’s blog. 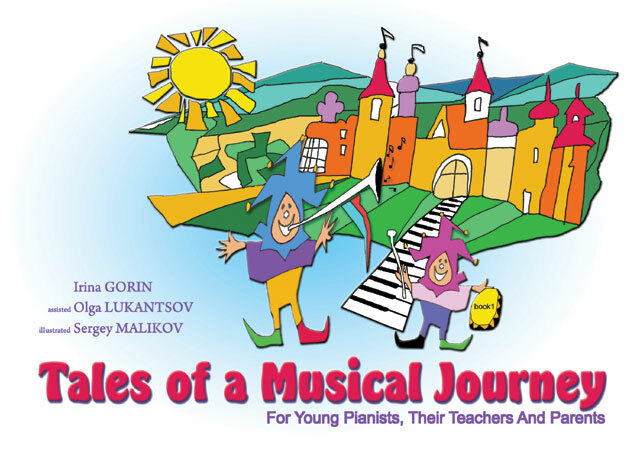 I would like to purchase your book A Musical Journey part 1 for my daughter who is beginning piano lessons. It is unavailable on Amazon. How can I purchase it?